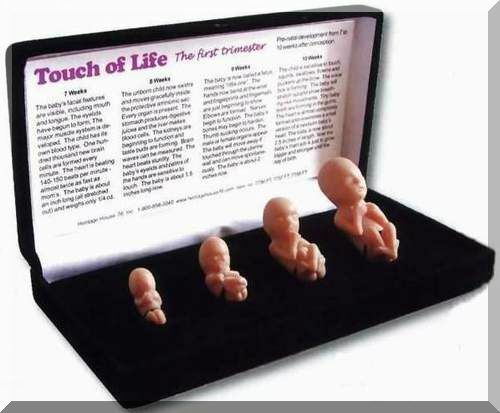 This Fetal Model Set has amazing detail to the babies with life&#45;like feel of the skin. The babies are 7, 8, 9 and 10 weeks after conception. These are the ages when most abortions are performed. Available in white, brown or black skin. The babies were individually sculpted to have a personality of their own. They can easily be removed from the black velvet display case for people to hold. The accuracy of the developmental stages was assured by using medical descriptions & actual scaled photos. Sizes: 7, 8, 9, 10 weeks after conception. Display Case: Black Velvet case includes the prenatal development displayed in the cover for each age. Babies are removable. Skin Tones: White, Brown, Black..